Home featured Nigeria BIAFRA: WHICH WAY NIGERIA ? 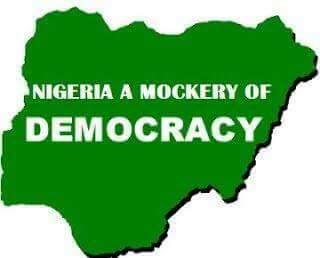 BIAFRA: WHICH WAY NIGERIA ?
. During campaign period Buhari’s supporters were seen trekked from Lagos to Abuja in solidarity for maximum support of his intention to patch the liking British enterprise today, none of them can proudly exhibit the risk taken at that time even electorates regretted indulged in election malpractice in making sure their incompetent choice candidate Buhari was snuffed in into power by all means. Now they all went hiding been fed up, frogs are all satisfied drinking water, including his kinsmen saw it as a misfortune which made them protested their disappointment against the fantastically corrupt kidnapping president. Every Nigerian is feeling the heat of state-sponsored terrorism, sudden disappearance of both young men and women, looting of public funds to the extend animals were alleged siphoned millions of naira in JAMB Office and money made for capital projects, this fraudulent deceive Buhari’s led government projected animals as human seems animals cannot neither be arrested nor sue for stealing in any court of law. With this criminal strategy, all APC members are innocent in the eyes of this most fantastically corrupt regime in the history of Nigeria as formal British Prime Minister David Cameroon was caught on a camera whispered his colleagues. Respect for rule of law is in shamble, a judicial arm is under executive control, The court as the last hope for common man is now the best option for political criminals, the constitution itself has metamorphosed to military decree where totalitarianism is the order of the day. Illegal detention of an eloquent opposition in order to insert fear not to speak up is a daily occurrence, denial of right for freedom of speech and confiscation of journalists, intimidation and high rate of both police and military extortion makes US released damning human rights reports on Nigeria. Confusion triggered from centre to local level clergymen on rampage clamouring to embark on national protest for bias Islamic favouritism against Christian communities. Buhari having succeeded converted a secular country into Islamic caliphate and state of nature where both Christians and factional Islam (Shiite Muslim) are hunted down like animals without anybody coming for their rescue was a prophecy made by IPOB leader Mazi Nnamdi Kanu, but tagged a hate speech. The military has gone to the length of escorting herdsmen to carry out attacks as reports from different quarters speculated. Very pathetic! Those assigned to protect life and property always disappear once terrorist attacks are ongoing instead coming hard on victims trying to defend themselves to handover materials in their custody. Buhari’s regime atrocity inflicts pain and agony in different families, their sins were only voting in a wrong heartless military junta putting on civilian clothes while inside his heart he remains whom he was Adolf Hitler of our time. A bunch of corruption disguising as an anti-corrupt crusader was a chairman of Petroleum Trust Fund (PTF), where millions of dollars disappeared under his stewardship, You Nigerians that lacked record were unaware Bubu’s vindication on Haliburton scandal till date that allegation has not been addressed, today he is a Petroleum Minister since he assumed office as president no account for excess crude has been given all his fellow Nigerians are afraid to speak up those that made attempts were harassed by EFCC and political thugs to go back to their shield. A strange name like economic recession surfaced from the nowhere foreign reserve is below expectation due to maladministration, unviable economy and strict economic policies chased foreign investors out from Nigeria terrain to relocate to favourable neighbouring Africa nations. Which way Nigeria? Your fraudulent immunization vaccine against unexciting Monkey Pox in Biafraland suddenly pick raced when IPOB raised the alarm of biological weapons of warfare against Biafra children to reduce population density with dying slow injections. This evil species from the pit of hell working around the clock to please his heart by spilling the blood of innocent Nigerians, by all means, is relentless to accomplish his desire. Furthermore, a gerrymander that his political appointments favored only Northern extraction is ignorant of democratic ethics and procedure of appropriation bill and procedure of country’s expenditure is undergoing impeachment saga over illegal purchased of $496m TUCANO Aircraft, this initial garagara by legislative members may not see the light of the day in that dumping cattle republic where animals are more valuable than human definitely, will use intimidation to subdue any senator raises head against tyrannical Buhari’s government without given a damn, opposition, debate as beauty of democracy. Hunger, poverty ravaging Nigerians blindfold some myopic ones to be curious to obtain Permanent Voters Card PVC in the name of patriotic Nigerians some with a baseless argument to use the PVC for bank transaction which is a total deception from Buhari’s led government to rig the already hopeless rigged forthcoming election. Propaganda upon propaganda is a modus operandi of this incompetent APC. Nigeria is the misfortune of true democratic federation in that slave camp, the best option is peaceful dissolution to enable serene atmosphere with all federating units going their separate ways.